When I agreed to run the 2014 Walt Disney World Marathon, I swore that I would be “one and done” for full marathons. So why did I agree to enter the MCM lottery when my brother and my friend Ryan asked me to do so? It could be because I am an idiot, or that I can be talked into nearly anything involving races, or perhaps it was just that I figured my odds of getting in through the lottery were so small, I had nothing to lose by agreeing to enter. Well, guess whose number got picked first? Yup, and just like that, I was committed to another full marathon. The good news was that, as a graduate of both Georgetown and George Washington Universities, I spent a great part of my formative years in Washington, D.C., and consider it to be my adopted hometown. So this would be a great opportunity to run a race there, even if it was 26.2 miles. 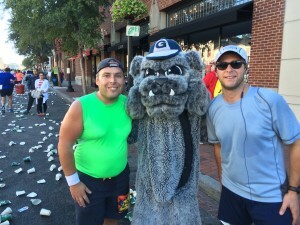 My college roommate, Joe, also decided to run this race. So, there was no backing down. Mike enjoying the White House with his family, and of course representing Team Casual Runner with the logo shirt. 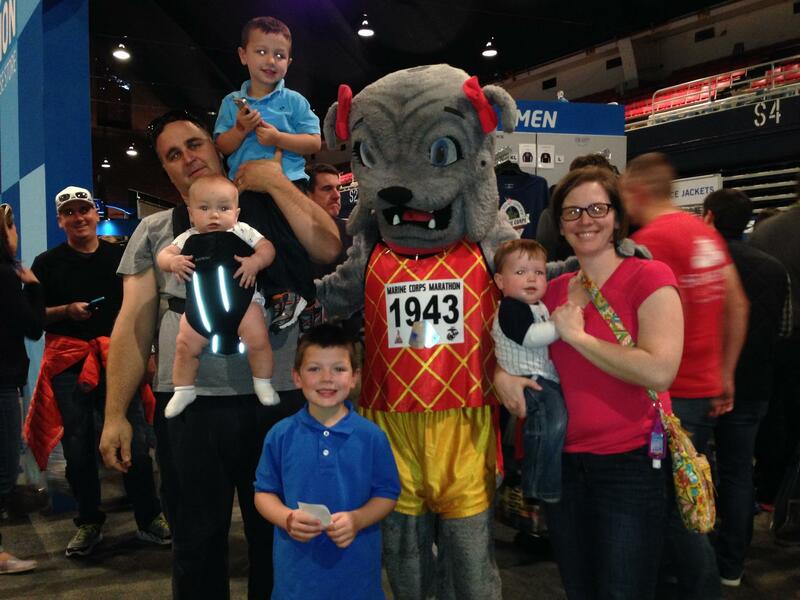 As one of the premier marathons in the United States, MCM is very popular. They moved to a lottery system for awarding bibs. So, if you want to run this race, you have to enter before the lottery deadline and be selected, or enter through a charity bib program. I have nothing but the utmost of respect for the marathon, and training requires not only a huge physical and mental commitment, but also a ton of time for long training runs. Heading into this race, I felt under-trained. I did run 3 half marathons and several double digit training runs since Labor Day weekend, but I never exceeded 13.1 miles on any of these. I tried, but was thwarted by sickness, weather, or just a lack of mental fortitude. Thus, I went in with a race plan that assumed I could handle the first 15-16 miles of the course, and then would have to hold on and dig in for the last 10-11 miles. Joe had completed a 100 mile charity bike ride the week before, so we decided that we would run the entire race together and pace one another, and I would be glad that we did. Running with him not only helped me get through this challenge, but it was enjoyable to take on this race side-by-side with such a great friend. Add that to my brother and Ryan also running it, and I was determined to go out there and conquer this race. 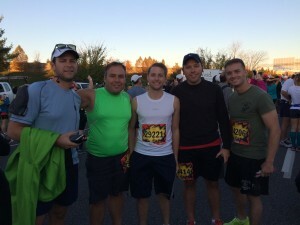 With both my brother and two of my best friends running this race, we decided to make this a runcation. So the travelling party would be myself, my brother, Joe, Ryan, Bill (Ryan’s good friend and a Marine), my mother and stepfather, sister, brother-in-law, sister-in-law, 4 nephews, and my sister-in-law’s mother. So we loaded up two cars, others booked their flights, and we were off. 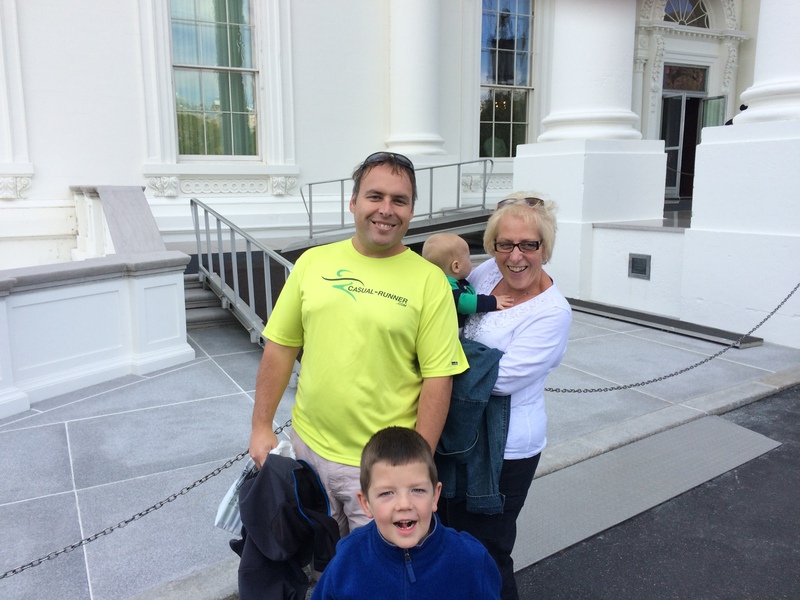 We arranged for a tour of the White House, which was both amazing and a memorable way to kick-off the race weekend. For dinner on Friday we carbo-loaded at one of my favorite restaurants of all time, Filomena’s in Georgetown. When we woke up on Saturday, I was not feeling well (TMI alert: it was a very uncomfortable G.I. issue that made me worry about the race the next day, but it eventually resolved). I let my family go on to the National Zoo (they loved the Pandas) and I decided to hang back with Joe and Ryan. We took it easy, went for a walk, did some light shopping, then grabbed lunch and watched college football. The key was to not overdo it on our legs. I was in bed by 9 pm, which meant that I missed most of the Ohio State game – the sacrifices we make for our Casual Running! Mike’s family enjoying the race expo. Trust me, the fact that the nephews are not freaking out while having their picture taken with a costumed mascot is a huge victory. I had read several reviews where people raved about this expo in prior years, but it really was just alright. It was held at the D.C. Armory, which frankly, is old, dark, and not a particularly great venue. We went twice. First, on Friday afternoon, traffic was heavy and finding parking was a complete mess as the signage was confusing and contradictory. It took about 5 minutes to get into the expo as everyone was subject to a security check. When we went on Saturday afternoon, however, the line to get into the building went out the door, down the steps, then wrapped around the corner and down the entire city block. They tried to keep the line moving, but it took more than 30 minutes just to get into the building. The layout was not particularly intuitive, this just was not the best of venues for such an event. We had to ask for directions to bib pickup, which was downstairs, but did not take that long on either day. On Saturday, there was a long line to get back up the stairs to the main event floor. T-Shirt pickup was efficient, but not all of the bags contained the race programs, which we did not notice until after we had left this area. Brooks, who was the official apparel provider, had a nice selection of event merch and some cool animated running mannequins on display. There were long lines to check out, but they kept them moving. As for the rest of the expo, again, it was not intuitively laid out and I could not find any maps telling us what vendors were there or where they were located. In fact, I did not even know that runDisney had a booth there, until I saw their tweets after we had left on Friday. I made a point to look for them on Saturday, but it was hard to find them as they were in an awkward location behind the steps you come up from bib pickup. The atmosphere in the venue on both days, despite being filled with runners, was very muted. Like I said, it was dark, there was not any music, and really not much to do or see. Overall, I was disappointed by the expo. When you see a sign that declares “It all starts HERE!”, the adrenaline starts pumping. I did not get to see the 10k shirts, but all marathon runners received a heavy, dark brown Brooks long sleeved shirt (for cold weather). This was a different take as I am used to receiving lighter weight shirts from races. The shirt is clearly mean more for training than to wear around and show off. 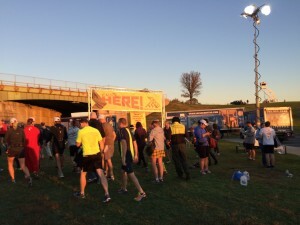 All runners also received a coupon for free Chipotle – who doesn’t want a free burrito? If you want to run a race in good weather, sign up for one I am running. I swear, I have had the best luck with race day weather, and this was no exception (and do not think for a second that I take this for granted, because I do not). The forecast called for temps in the high 50s to low 60s, with a slow warmup, sunshine, and low humidity. Perfect! I opted for a kit that included Layer 8 running shorts, a SweatVac race hat, Adidas Climalite compression shorts, a Reebok dry fit tank top, C9 wristbands, and Saucony natural series running shoes. Again I grabbed my Yurbud triathlon series headphones and my IPhone 5S. I made a completely new custom playlist for this race, but more on that later. I woke up feeling GREAT! It was a complete 180 from the day before. I had some iced coffee in the hotel fridge to help wake me up before hopping in the shower. My breakfast consisted of two plain bagels with peanut butter, a bottle of Nesquick (Samoa flavored), and a 32 ounce Gatorade. I started the hydration early and was glad for it, as I would need every bit of it on this day. We stayed in a hotel in in Crystal City (Arlington, Virginia), so my brother and I walked down to the 23rd street shuttle station, which was a complete cluster. The line was down the sidewalk and weaved several times around the entrance of a parking deck. The problem was that the line blocked people from entering, and the cars who were trying to enter in turn blocked the loaded busses from pulling away. This only served to further delay things. All told it took us nearly 40 minutes to get on a shuttle. Ryan, Joe, and Bill were running late and their hotel’s shuttle never showed up, so they opted for a cab. 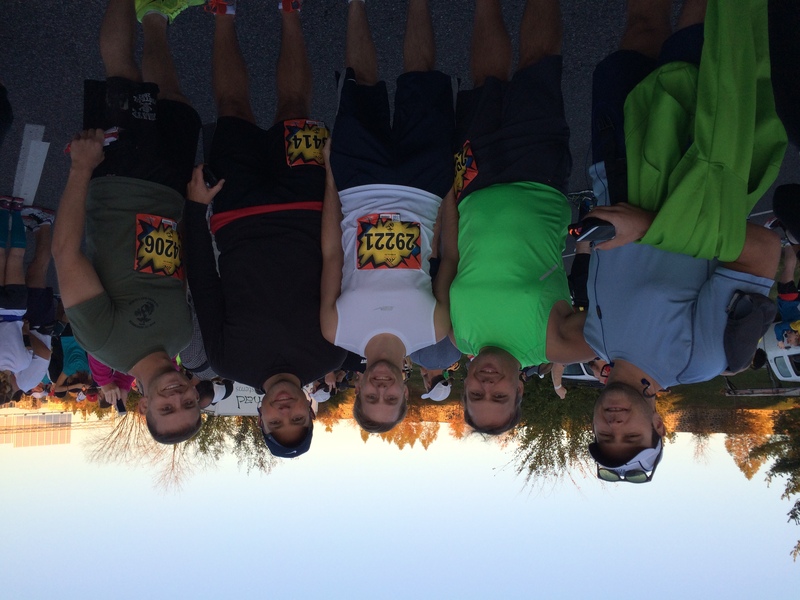 Team Casual Runner for MCM 2014: Joe, Mike, Ryan, Frank, and Bill. Here is the bigger problem: the shuttle dropped us off at the Pentagon Metro Station, on the south side of the building. Had we known this, we could have walked there in less time than we waited for a shuttle, and from the drop off, we were still a long, slow walk away from the starting line. Even though we left the hotel with plenty of time, we were going to miss the pre-race festivities. My family was about 45 minutes behind us, and the great thing for them was that the shuttles were open to spectators as well. The problem was that they too would miss much of the pre-race festivities because the lines had grown even longer. Everyone entering the starting area was subject to search, and the lines were slow. I am a big supporter of security and making sure everyone is safe, but they could have easily had lines set up for people like us who had no bags and could have gone through quicker. As it stood, my brother had to rush to find the gear check truck and we made our way to the starting line. Then, the Marines took over. We missed the national anthem because of the aforementioned logistical issues, BUT the aerials were awesome. Marine paratroopers jumped out over the runners and everyone applauded and cheered. They were carrying several large American flags, which made for quite the sight. We were then treated to a flyover by Ospreys. They didn’t just come over once, they circled around and made multiple passes. You have to hand it to the Marines, there was no way you could NOT be pumped. They shot off a Howitzer to let us know it was go-time. We were ready to run. I am not a fan of mass starts, and this race was no exception. It was a slow shuffle before we crossed the starting line. And then the course remained congested for the first 1.5 miles, but it was manageable. But, that is about all that I can say bad about this part of the race, because it turned into pure awesome from there. Hoya Saxa! Mike, Jack the Bulldog, and Joe, all representing Georgetown University proudly on this day. But first, my mistake. After all of the problems that I have had with I-Tunes in the last month, I did manage to load a new playlist just for this race. When I went to start it, my music would not play. None of the songs would. When I first started out running, this would have completely freaked me out. But I just repeated my mantra when something goes wrong on race day: Accept. Adjust. Advance. I rebooted my I-Phone, and after a few minutes, it started working again. As we made our way north along route 110, we passed Arlington Cemetery and Iwo Jima, where the Marine Band was playing in their full dress uniforms. Those guys have some mad skills. We made our way into Rosslyn where the crowds were electric. I will repeat this many times in this review: I have never seen such great crowds as I did on that day. Most of the course had large numbers of spectators, and they could not have been more supportive. The second mile plus is all climb as we made our way north from Rosslyn. As this was a Marine Corps event, Joe made it is his mission to stop and pet every bulldog along the course (he and his wife Caitlin have 2 of their own). He found a few cute ones on the climb, so we stopped briefly and then resumed on our way. We then turned and made our way down Lee Highway towards the George Washington Parkway. This stretch was gorgeous: high rock cliffs lined the road and the trees were just starting to change color. Unexpected Magic. Once on the GW Parkway, we were treated to a gorgeous view of Georgetown University – where Joe and I attended. It was beautiful. I may have even started singing the Alma Mater out loud. We climbed up the ramp to the base of the Key Bridge, and were met by more large, raucous crowds. These folks really brought their game that day. As a student I crossed the Key Bridge countless time, but that day, as it was lined with balloons and spectators, was truly memorable. Magical Moment. We turned right into Georgetown and were greeted by the Georgetown Pep Band and Jack the Bulldog. If you can pardon a moment of indulgence, as a four year member, the Pep Band was the defining part of my collegiate experience. To this day, some of my best friends (including Casual Runner’s very own Jennifer) are alums of the Pep Band. To have them playing during this race was very special to me. We stopped for quick pictures, thanked them, and were back on our way. After a quick turn towards the Georgetown Waterfront and past the Watergate complex, the course made its way into Rock Creek Park. In all of my years in D.C., I never spent any time there, but the park was a great location for an out and back portion of the course. Rant alert: There was one exception where a gentleman decided that he was going to use the turnaround to stage a political protest. Now, I will not give him the pleasure of naming his cause here, but suffice to say, any race, let alone one staged to honor the Marine Corps, is not a place for you to make a political statement. To this idiot, I say, way to try to take the focus off of the corps and the runners and try to make it all about you. What a jerk, as you can see, this really bothered me, and still does. Even if you don’t care about the runners, the Corps deserves more respect than that. As we exited the park, I saw one of my oldest and dearest friends, Kelly, who came out to support us. She was amazing how much ground she covered that day. I made sure to stop and give her a hug, seeing her meant a lot to me and gave me the encouragement to push on. 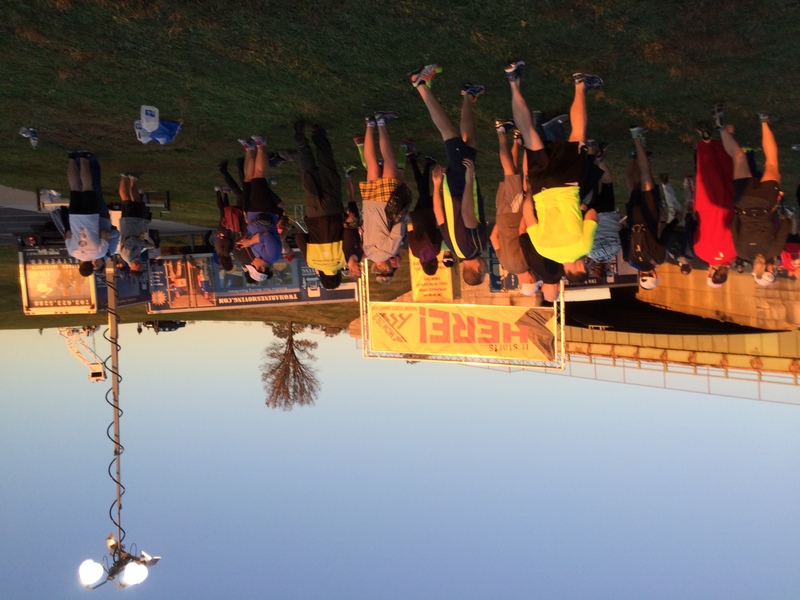 There is plenty of more coverage of the 2014 Marine Corps Marathon yet to come. Check out Part Two of Mike’s Race Review here, and stay tuned for new event videos on our YouTube Channel. So you do not miss this and other great content from Casual Runner, please be sure to like us on Facebook, follow us on Twitter, and subscribe to our YouTube channel. The Casual Runner Team wants to hear from you. If you liked Mike’s review, have any questions, or want to share your story, please leave a comment below or email us using the link below. See you out on the running trails!